JDS Solutions is the developer of WinRetail® management software for mid-size independent retailers. To promote their product to over 30,000 members of the retailing community, JDS exhibits in Retail’s Big Show in NYC. JDS has been a client of Nomadic Display since 2010. Initially they exhibited in a 20’ inline trade show booth and then upgraded to a 400 sq ft island beginning in 2013. “We prefer not to be locked into a particular configuration. Trade show display rentals. give us the freedom to market ourselves with a unique exhibit design every year.” says Jeff Weingrad, Executive Vice President of JDS Solutions. To explain to prospective clients how WinRetail management software can improve their business from the storefront to the back office, The Stephenz Group, JDS’s agency created an infographic entitled “The Great Race to Win Retail”. The race course illustrates software benefits such as inventory reduction, faster merchandise turn over, and increased profitability. JDS wanted the infographic to serve as the centerpiece of their tradeshow display graphics. The Great Race theme was also integrated into their trade show marketing campaign which included print and online advertising, email and telemarketing. Experience and formal research tell us that attendees prefer interaction to relate to products. So during an exhibit design briefing with Nomadic, the team came up with the idea to build a slot car raceway into the display. All agreed it would be a fun and engaging way to entice visitors to learn about WinRetail. JDS Solutions was so pleased with the results they plan to use the same trade show booth design next year – for the first time in five years. JDS’ primary goal at trade shows is to capture and convert opportunities so the metrics they measure are based on quality over quantity. Race winners were rewarded with a winners’ circle certificate featuring a limited-time discount offer on WinRetail software. When asked what element of the project he was most proud of, Jeff Weingrad replied “The team.” The creative energy, enthusiasm, and meticulous detail expressed by Nomadic made us feel like they were members of our own staff. Nomadic designers worked closely with JDS and their agency, The Stephenz Group, too. Promotional products can play an important role in an integrated trade show marketing program. They can be used to draw traffic to your trade show booth, to target your audience or serve as a parting gift to thank visitors for their time. Promotional products are usually given away for to visitors in hopes of positively influencing their purchase decision. So it’s important to keep two points in mind when choosing your promotional items. First, your gift should align with your brand or the campaign theme expressed in your trade show display. Second, the item you giveaway should provide value to the recipient. The Advertising Specialties Institute conducts a Global Impressions Study each year. Their findings confirm that the best trade show promotional products are those attendees will find useful after the show. Promotional items keep your brand visible to recipients so they remember you. For example, people keep desk accessories for up to 14 months and over 60% keep them at the office. This may explain why practical items like writing instruments and USB drives are among the most often cited giveaways. Calendars are a popular gift if you want to give visitors an item they will reference. Shirts, bags and caps are popular too. Trade show attendees keep wearables such as caps and shirts if they’re attractive. Plus your brand gets the added benefit of being seen by more people. Premium giveaways can also be used to target customer types. For example, reserve a higher priced gift for your most qualified prospects and offer a different, yet useful, item to all other visitors. Promote a gift to your top prospects in your pre-show marketing campaign and when they arrive to claim it they’ve identified themselves to your booth staff. For further details on promotional product preferences by age, gender, income, geography or political persuasion, read the full report. • Digital communications enable you to connect with prospects before your trade show. Online ads, email, and social media make an impression on your audience so they put you on their “must see” list at the event. • Technology plays an important role engaging visitors during the show. From interactive games, electronic surveys and quizzes to audience triggered presentations, technology drives traffic. • Technology can help you to demonstrate complex products using video or animations or touch screens in your trade show display. • Recording contact details during the show is key to measuring your trade show results. Apps, bar code scanners and other technologies can make it faster for you to capture and qualify your visitors. • Increasingly sophisticated tools make it easier to maintain contact with your prospects after the show so your company or product stays “top of mind” with prospects when they need what you offer. 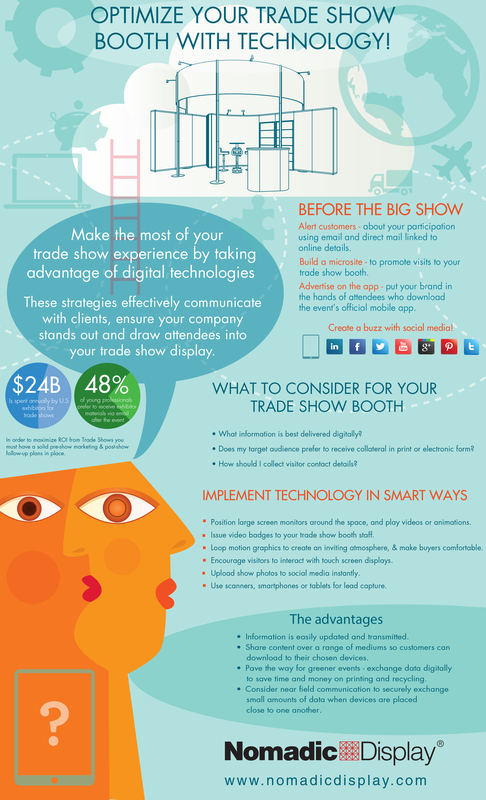 To help illustrate some key ways in which technology may be applied your trade show marketing, we created this infographic. Download the graphic for your own use and feel free to share it with coworkers and colleagues. You may also publish it on your own website – so long as you do not alter the design. If you opt to add our infographic to your site, for ease we have included an embed code at the end of this article. Simply copy it and paste it into your site to instantly display our image. Executing effective trade show marketing takes more than just showing up. Make the most of your trade show experience, and take advantage of technology. The use of digital communication methods can ensure that your company stands out and draws attendees into your trade show display. Position large screen monitors around the space, and play videos or animations. Use video badges for your trade show staff. Loop motion graphics to create an inviting atmosphere, and make buyers comfortable. Encourage booth visitors to interact with touch screen displays. Upload digital photos to social media instantly. Use scanners, smartphones or tablets for lead capture. The placement of one or more large screen monitors in your trade show booth will draw visitors’ attention long enough for a member of your booth staff to engage them in a conversation Videos should be eye-catching, concise and to the point. They can promote products, provide demonstrations, present client testimonials, or do all three. Be sure to use colorful graphics, music and movement when creating animations for your trade show display. Why choose between education and entertainment when you can do both? “Edutain” your trade show audience with touch screen kiosks, tablets and other interactive opportunities that enable visitors to explore information on your products based on their interests, and at their own pace. Electronic games such as slot machines, Plinko boards and toss-and-win are an exciting way to engage and reward attendees with prizes. Generating sales leads is often one of the primary goals of your trade show marketing plan. Badge scanners capture leads electronically so they may be imported into your database or CRM. Use your smartphone or tablet to snap photos of attendee business cards so you won’t have to rely on handwritten information that might be difficult to read. Tablet apps, like Nomadic's Media on Demand, capture leads, enable you to email information tailored to the conversation, and provide tracking reports. The digital age is upon us — in our homes, in our cars, in our offices, and in our trade shows! DJ Heckes, CEO of Exhib-it and Laura Furumoto, Owner of Marketing To Go Now, have created a 4-part webinar series for 2014. It is intended to educate current and future exhibit managers about the importance of trade shows and events to their marketing mix. They point out that today’s newly minted marketing managers need to develop and implement an event marketing and sales strategy designed to achieve business objectives. So the first webinar in the series introduces companies to the big picture on trade shows and events. Engaging and enlightening DJ and Laura take the audience on a one hour trade show marketing journey using their extensive experience, industry research and case study examples. If you missed the live session, you can still gain the benefit of their insight from an on-demand playback here. Don’t miss this informative session based on the new book “The Noise Behind Business” co-authored by industry veterans, DJ Heckes and Chris Kappes. Order your copy here. Be sure to register today for the next session, “Selecting the Right Shows”, on April 22nd. It's no secret that everyone in the trade show world is buzzing about new technologies and how to apply them to their trade show and event marketing programs. Marketers have a high tech future full of new gadgets, apps, and interactivity devices to help them engage potential buyers before, during and after the show. Exhibitors want to learn more about them so they won't be left behind. Events are bursting with exhibitors using large monitors, touch screens and projection systems integrated into their trade show display. Touch screens are being embedded into counters like the one below by Nomadic Partner Hamilton Exhibits. RFID (radio frequency identification) tags are microchips with an antenna that can be attached to any object – a pre-show mailing, a show badge or a token for an in-booth game. When the tag comes within range of an RFID receiver it can trigger lighting, sound or video in your display. These devices are expanding how exhibitors can attract, stop and engage visitors on the show floor. Some experts are predicting that tablet sales will exceed PC sales this year. Tablets are being used for everything from controlling presentations to theatre groups to facilitating one-on-one conversations. And they are probably one of the most popular giveaways in prize draws too! Smartphones are getting smarter at being able to deliver all kinds of content. QR (quick response) codes grew out of bar coding technology. You've seen those black and white squares printed on everything from ads to display graphics. The next generation is digital watermarks which can be associated with any image but are only seen by smart phones. Both require downloading a reader App to the smartphone in order to connect to images, websites, even videos. NFC (near field communication) establishes radio communication between smartphones by touching them together – another new way for visitors to share your content socially. In short, 2013 is shaping up to be an exciting year for technology that will benefit both trade show exhibitors and visitors. All in all this is very good news for those who take advantage of these changes and do their best to be on top of the tech game. Exhibitors dream their program and then create it, too. At a trade show your goal is to reach your target audience. Your advertising campaign, exhibit design and promotional strategies should work together to inspire your audience to visit you and learn about what you can do for them. Simple? Not so much, which is why exhibitors depend on internal and external resources to write, photograph, design, fabricate, and build material for pre-show, at-show and post-show event marketing activities. That got me thinking about where the various contributors find their creative inspiration. When asked, the exhibit designers I spoke to said they get their inspiration from the exhibitor; by what the company does and through conversations about what they want to accomplish. So where do exhibit marketers get their inspiration? There are a number of sources for inspiration including peers, magazines, newsletters, other exhibitors and, of course, websites. Display solution galleries enable exhibitors to browse trade show display designs that offer their desired features, functions and details – or perhaps features that are brand new to them! While some exhibitors locate the exact design they want, many locate several examples to express the characteristics or attributes they want to combine into their own customized display design or environment. Tell us about your sources of creative inspiration. Study after study shows that companies believe trade shows are an important part of their annual marketing plan. However, while companies are gradually beginning to invest more in marketing, they still want to know the results from that investment. After organizing a compelling trade show booth and promotion campaign marketers return from the event. Then the time comes to demonstrate the value of their participation in trade shows and events. This often leads marketers to express frustration. At Exhibitor2011 there were more than 20 sessions on trade show measurement and demonstrating ROI – something we help you do in our brochure on successful exhibiting. In fact, it’s one of the most popular topics at the annual conference. So I asked colleague and workshop presenter, Susan Brauer of Brauer Consulting Group. Susan teaches that the purpose of the trade show is to accelerate the sales process. She believes the bigger issue is that exhibitors don’t understand what can and can’t be measured so helps them set measurable goals that move the sales process forward. Build upon a baseline from your past show to formulate goals for your next show. Then be sure you have methods in place to record the results and compare them to the goal. You can also find some additional tips by downloading our Successful Exhibiting Guide in our Resources area. What frustrates you about trade show and event measurement?